The Rochester Model: 2021 Strategic Plan for University Advancement established specific, measurable ways to grow private giving, advocacy, and engagement in support of the University’s mission. It’s a model that is grounded in partnership. By developing meaningful and lasting relationships with our alumni, parents, and friends, the broader community will feel fully invested in—and responsible for—the University’s success. 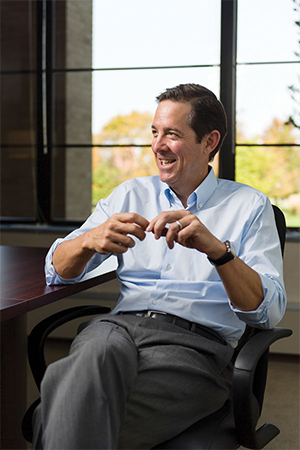 Tom Farrell ’88, ’90W (MS), senior vice president for University advancement, is committed to building on this momentum, fortifying the Rochester Model, and fostering our “culture of ownership” as the University continues to move ever forward. What is so special about the University of Rochester? What do we do really well? Our size and scale are key differentiators between us and other universities. We are relatively small compared to our peer institutions in the Association of American Universities (AAU). Our collaborative and friendly culture also helps define us. We have a compact campus that includes a major medical center in a mid-sized urban area. We have a significant research portfolio and strength in the natural and social sciences, medicine, and engineering, but we are also strong in the humanities and performing arts. We have a great residential undergraduate experience and tradition. When you factor in our very strong faculty and students, and our unique mix of professional schools (Eastman School of Music, Simon Business School, Warner School of Education, the Schools of Medicine and Nursing, and the Eastman Institute for Oral Health), it makes for a very interesting environment. How does Advancement fit into this? Advancement is really a label for engagement. If alumni, parents, friends, students, faculty and staff aren’t connected and engaged in the mission of the University, and with each other, the University won’t be as strong as it can be. Our programs are all about building culture, and in particular, a mission-based culture; one that helps the University make a difference in the world. In Advancement, we have to sustain relationships and connections, so that people feel like University investors and owners. Clearly, our alumni and friends care about this place and its future. They want to help promote it. Our work goes well beyond just raising money and classic alumni connections, though that’s certainly part of it. How important is the student experience to engagement? It’s a core determinant and helps set up a long-term connection to the University. Is the University culture I described a good fit for our students? Did they flourish, benefit, and contribute while they were here? Did they have a good experience out of the classroom, socially, and in the broader community? As a graduate myself, I know that Rochester helped me become who I am. It gave me a perspective and experiences that strengthened me. It gave me a more complete ability to think about my life and my future. The student experience is core to our mission. In many ways, it defines who we really are as an institution. How do we extend that relationship? People want to support an institution that’s been an important part of their life. They also want to make a difference through their giving and engagement. We have to help people connect the dots between their experience on this campus and how it can continue to be a meaningful part of their lives. We also enjoy being with others who share similar feelings. So, part of our job is to connect the Rochester family to each other. In your view, what does meaningful engagement look like? For me, that means engagement that has benefits for the University and for the person who is involved. It should be mission-based and lead to an outcome. There are many ways to make a difference: career and placement support through the new Meliora Collective program, admissions volunteering, fundraising, event support and general networking, the schools, libraries, and many volunteer engagement opportunities in the Medical Center. We have several thousand volunteers supporting us in more than 80 formal volunteer groups, and many dozens of other groups and committees. We need the support. So I hope anyone who would like to help gets in touch with us. How is engagement connected to philanthropy? They’re not just connected, they’re interdependent. They’re the same thing, in my opinion. I don’t think you can have successful philanthropy without successful engagement, and I’m not sure you are fully engaged if you don’t recognize the importance of giving in supporting our mission. Giving is a manifestation of connection, belief, and participation. Engagement has those exact same characteristics. Philanthropy can’t happen outside of a genuine commitment on behalf of the University to engaging, over long periods of time, with all our communities. Without that commitment, it just doesn’t work. That’s something that everybody here is committed to—not just the Advancement office, but also the president, the deans, the provost, the faculty, the board, our volunteer leaders, and our donors. The Rochester Model for Advancement is built on these concepts. We recently completed the largest capital campaign in the history of the University. Where do we go from here, and what keeps you moving forward? I am focused on our mission and the difference we can make in the world. I’d like to believe that our core activities— teaching, learning, research, scholarship, public service, and health care—are what we are always paying the most attention to. If we do a great job in these areas, and require financial resources and other support to get this done, I believe people will continue to invest. There are people who came before us who’ve invested in this, and there will be more after us. But while we’re here, let’s help this University fulfill its broader mission. Be the best we can be and keep trying to improve. I really believe that. On a more personal level, it’s the people you work with to get that stuff done. There are a lot of really impressive people who make up and represent this great university. If we can continue to build on the momentum and the belief in this place, it will be a really good thing for the University, our community, and our country.